The United Nations Security Council is to hold an emergency meeting on Monday after Russia shot at and seized three Ukrainian naval ships. The incident on Sunday is a major escalation of tension between the two nations. Russia accused Ukraine of illegally entering into its territorial waters and blocked access to the Kerch Strait. The narrow passage between the Crimean Peninsula and Russia’s southeast connects the Black Sea to the Sea of Azov and is, according to a 2003 treaty, jointly administered by Ukraine and Russia. Ukraine denies Russia’s accusation and says it had informed Russia of its plans to move the ships from the Black Sea Port of Odessa to Mariupol in the Sea of Azov. It said six of its military crew had been wounded. Ukrainian President Petro Poroshenko said he would ask parliament on Monday to introduce martial law. Britain’s embattled Prime Minister Theresa May is to reiterate to Parliament on Monday that there is “no better” Brexit deal available. The British leader faces an uphill battle to get the draft Brexit deal — which was approved by EU leaders on Sunday — through her own parliament. Many in her ruling Conservative Party have publicly declared their intentions to vote against it. Northern Ireland’s Democratic Unionist Party, which props up May’s minority government, has also criticised the deal. Opposition parties, including Labour, the Scottish National Party and the Liberal Democrats have also said they would oppose the deal. British MPs are expected to vote on the Withdrawal Agreement on December 10-12. 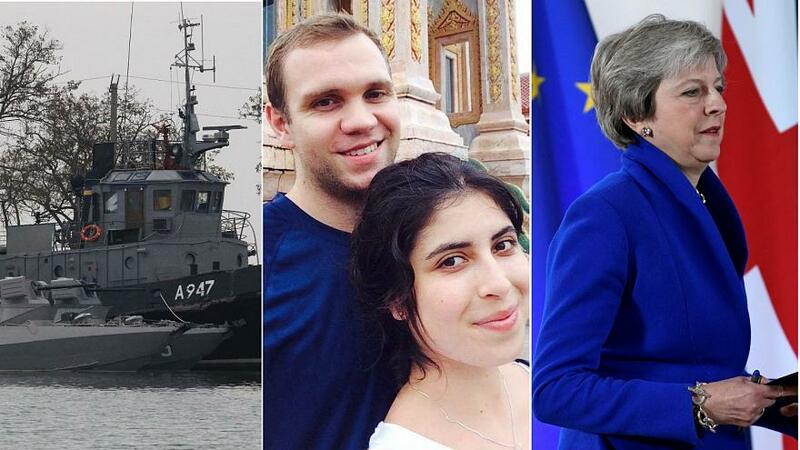 British academic Matthew Hedges, jailed in the UAE on spying charges, was pardoned on Monday. Hedges, 31, was detained by the UAE on May 5 and was last week sentenced to life behind bars. The UAE accuses him of spying on behalf of the British government, which both Hedges and the UK have denied. His pardon was just one of 785 issued by the king as part of a series of orders on the country’s National Day. Italian film director Bernardo Bertolucci died at the age of 77 following a battle with cancer, Italian media reported on Monday. He is best known for the controversial Last Tango in Paris as well as for The Last Emperor which won him nine Academy Awards in 1988 including for best director.